This is an excellent hotel and one I have always wanted to stay in. Me and my friend stayed here for 4 days at the beginning of July. I emailed the hotel prior to our visit and asked for a pool view. This request was met and we had a room on the second floor overlooking the main pool. The bedrooms are beautiful, lots of storage space and a huge mirror (important if there are a couple of ladies). Our room had a huge shower, no bath, with shower gel, soap and shampoo provided. I think the rooms with baths are on the ground floor. We had half board and this was sufficient for us. One day we swapped our evening meal to lunchtime which was the same set up as the evening. I would have preferred a sandwich/omelette. Not sure there were any snack type things for All Inclusive guests. The food was very nice, there was always something for every taste but I have to say there was nothing that stands out in my memory. The staff are lovely, nothing is too much trouble. I was a bit surprised how many children there were in the hotel, which wasn't a problem to us but I never really put this hotel down as a family hotel. I think it would be better as a couples hotel. Would have loved to try the other restaurants but the thought of queuing from 7am to book a table put us off. Sa Coma is being spoilt by the All Inclusive element which made the area very quiet (Cala Bona/Cala Millor were a lot busier) but we still had a couple of good nights in the Kings Head. I much prefer self catering to half board because I love to eat out but last year we didn't have any memorable meals so we chose half board because the deal we got was so good. Would definitely go back next year if the price is right. We're not long back from this hotel, staying 11nights from 5th July. We booked the hotel directly rather than with Thomson as this meant we could book one of their gorgeous suites rather than just a twin room, to accommodate my husband, teenage daughter and myself. Check in was very quick and efficient, almost seemed too quick as we were in such awe of the hotel reception that it took time to take it all in. Once we worked out how to get to our room on the 3rd floor, we opened the door to have all 3 of our jaws drop! This room is absolutely gorgeous and I believe that each and every other room is decorated in the same manner and style (my mother in law was also staying here in a twin room and hers was just as gorgeous). As you walk in, there is an extremely large bathroom to the left, this is decorated and styled very modern, just exactly what we love. The bathroom was in two halves, with the first area being the sink and large mirror, large vanity unit with drawers to keep things and to the other side a large Jacuzzi bath. Through a door way (no door) is a toilet, bidet and a very very large walk in shower, which has a large monsoon shower head as well as a hand held power shower, all I can say is - wow!! This is better than many hotels in the UK, and well worth its 4 starts, if not another one! To the right of the way in we had a large walk in wardrobe/dressing room. This has a long rail with as many hangers as you could need, loads of shelves and drawers for all your things as well as a seat, plenty space to store your luggage and the safe (which has to be paid for at reception). The next area is the living area of the suite, this already had the sofa pulled out and the bed made for my daughter. This was a large room, with an extra comfy seat and a coffee table. The mini bar is fully stocked in here and there is a large glass patio door leading out to the balcony. The final area of the room is the bedroom. This is entered by two large sliding doors from the living area and we were greeted by the biggest bed we have ever seen in our lives! It was well made and the decor of the whole room was gorgeous. There was a mirror, dressing table with a stool and drawer as well as a good sized flat screen telly, which had plenty UK channels, should you want to keep up with the soaps, or otherwise. There was another large patio door leading out to the other half of the patio - this was double the size of the regular rooms and had 2 lounger seats, 2 armchairs and table on it. Stunning view out towards the sea, and we could see the larger pool and the road leading up to the hotel which had some shops on it. Room perfect - until night time unfortunately. There was a bit of hustle and bustle noise from the street at night, also we were above the kitchen area of the restaurant and there would be a constant motor noise which you could hear when the doors were shut. We also heard the bin men at nights, which wasn't too bad if you are not an early sleeper, but some nights you just need to get to bed early and this didn't help. A few nights there was noise from the other hotels, they seemed to have outdoor entertainment, which went on till about 11pm - not a big problem, but again if you wanted to sleep early it was noisy. Don't be shocked if you are woken at 6am (or earlier) either as there is a family of hens that wander round the hotel and the cockerel likes to hear the sound of his own voice very early in the morning. Al this room needs to improve on this would be better glazing in the windows so that it sound proofs, then I would have called it perfect. The room was cleaned daily, I think they change the bed clothes every few days and will change the towels if you need them changed. We didn't have any tea making facilities (and MIL did), so my husband asked at reception and apparently you only get this when you book through Thomson, and it is an outside company that comes in to supply these. We were willing to pay for it, but the receptionist told him she would ask around the cleaners and see if they had a spare kettle in a cupboard that we could have. We didn't hold up much hope, but when we came back we had a full tray with everything we needed, and weren't charged for this. The hotel has 2 pools, although we never went near the large pool at all. It did look very busy at times and we expected a bit noisier than the smaller pool round the other side of the hotel. This pool was perfect, always easy to get a bed and really nice and peaceful most of the time. It was very clean and very well looked after and the lifeguard does a patrol of it every so often. The food was a buffet service. I think at first you go in with a bit of caution as you don't know what some of it is, but as time passes you become more confident at what you are getting. We tried to book at the Italian a couple of times, but had no luck at all. This is something that really needs to be looked at. My husband went down to reception at 7.15am on our second last day to try and fit the 5 of us in to the Italian. The reception doesn’t take bookings until 8am, and then everyone just starts forming a queue. My husband was about 4th in the queue and really thought he had a chance. 1st people booked a table for 6, 2nd booked for 4 and the person in front was a 2. By the time he got there he was told there was only a table for 2 left. I am very surprised that this hotel only has an allocation of 14 seats at the Italian restaurant, and this really really needs to be dealt with. There should be direct booking services with the restaurant where you can call to book for whatever night you want, not just the same day you book. It is very unfair that a group of people staying for 11 nights, who tried to get a table at least 7 of those mornings don't manage to get one. It's very badly run and I do hope they make some changes to this. We did however, get a table at the Country Grill one night. This is over at the Safari Park Hotel and is basically a BBQ buffet. But the best bit about this meal was that the drink was self-service and you could take as much as you liked. There was Lager, White, Red & Rose Wine and all the soft drinks and water. We really enjoyed this meal and went back a second time, however this wasn't as good this time and there was much more queuing, so I guess it just depends what day you pick and how busy the hotel is. Back to the buffet in the restaurant, it was very nice. Maybe a little samey some nights, but always a lot of choice and very fresh food. I'm not sure I’d want to be AI as the buffet lunch looked very similar to the evening meal. The staff I cannot fault at all, they were always very pleasant and smiley. They seem to work very very long hours and practically every day too. And I was extra surprised by a complimentary bottle of 'champagne' left in our room on the 2nd night from Chej, the manager, who I had asked a few questions via Facebook before we left and had left me a note to say this was as promised on Facebook. I never expected this at all, and I was really happy he had bothered to do it. p.s. - I should say that my MIL's room was just as beautiful as ours although a little smaller of course, they had a ground floor room with a terrace that came straight out to a grassy area which was right beside the small pool. They also didn't have any complaints of outside noise, so perhaps having a room round this side is more peaceful and it's possibly something we'd look into if we do get to go back. We stayed at this hotel from 26th June for a week. It was absolutely fantastic, with extremely friendly staff, spotlessly clean everywhere, really good food and variety. The weather was beautiful but even if it’s not there is plenty to do around the hotel and resort. The children loved the swimming pool area with plenty of sunbeds available. The all-inclusive package worked well for our large family with unlimited food, drink and ice creams all day long. The entertainment for the children was limited to half an hour in the evening but they also enjoyed the adult entertainment which was quite good all week. The water park is a good day out attached to the hotel complex and worth the small fee. All in all I would recommend this hotel and would definitely return. Not worthy of a 4* or Platinum. Food was tasteless and the dining room resembled a school canteen. The entertainment was diabolical - every night! There is no entertainment for children during the day or evening. The gym consists of a 20 year old treadmill and a bike and free weights. There is no a/c in the gym. The sport facilities at the club house are good and we had no problem getting sunbeds by the pool. We went to this hotel on a Thomson Platinum holiday and were not disappointed! The hotel is immaculate, with rooms cleaned each day and our bathroom towels were changed daily too! The staff were extremely friendly and couldn't do enough for you. The food was varied and excellent - the chefs created amazing sculptures out of vegetables, ice, fruit etc., to decorate the buffet each evening - There were also local dishes available at all meals if you wanted to try them which I personally enjoyed very much. Outside, the 2 pools were beautifully clean with plenty of sun loungers around. The hotel gardens were lovely and well tended. There was good entertainment in the hotel bar each night. This hotel is one of the Thompson Platinum hotels and I think within some of the printed reviews some people have confused it with the Sa Coma Platjia. The hotel had a lovely spacious lobby area all black and white marble with a large fountain in the middle and lots of sofas and comfortable chairs. There was a large bar area inside where the entertainment was in the evening and a large pool bar outside but under cover. The drinks and food were very reasonably priced. All the rooms have balconys. Our room was on the ground floor and looked out onto the pool area, but for privacy we looked out onto beautiful exotic plants and trees - the landscaping around the hotel was beautifully done. The rooms are all the same, spacious with decent bathrooms ( yes with a bath as well as a shower!. We had a beautiful flower arrangement and a bottle of wine in our room on arrival. There are three outdoor pools and one indoor with plenty of comfortable sunbeds. There were never any problems getting on at any time of day and the staff would always bring out more, consequently no-one reserved them in the morning. There were lots of daytime activities for children if they wanted to take part - darts, pool, trips to the min golf park, colouring etc. In the evening there was a varied programme of entertainment with magicians, bands, acrobats, dancers and we thought they were all of a good quality. The food was fantastic - all buffet style and very good quality, beautifully cooked, you could help yourself to whatever you wanted. We stayed for a week and the menu never repeated itself - they even had a fantastic gala evening where fruit and vegetables were carved into animals etc and the displays were quite incredible. The staff were pleasant and helpful, I would definately recommend this hotel. The rooms were satisfactory, good that there was air conditioning throughout the whole apartment, they were a decent size. It would of been better if the rooms were cleaned a bit more often like every other day rather then 3 times a week. The hotel location was wicked it was really close to the beach which meant we didn't have to walk miles back to the apartment. The hotel staff were nice. The entertainment was amazing we had the BEST entertainers!!!! I would go back just because of them. 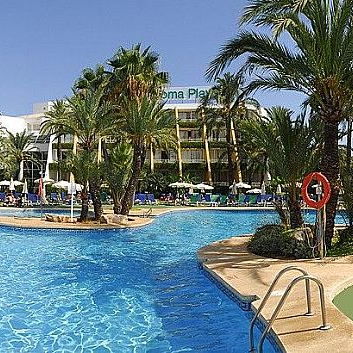 I visited the Sa Coma Playa Hotel [not to be confused with the Sa Coma Platja] last summer with my son. I booked independently with Thomsonfly both the hotel and the flights and hired a car for the week. The hotel is set just a few hundred yards back from the beach in fairly extensive grounds. There is a swimming pool on the front of the hotel which is not really used and another pool at the rear of the hotel which is fairly busy. Plenty of sunbeds. Pool towels are available for a deposit and can be changed for clean daily. I had booked a twin but when I arrived had been upgraded to one of the suites which were on the top floor...... very nice. Beds were changed every other day and the rooms were immaculate. Breakfast and dinner were both buffet service and there was ample choice/food of a good quality. The hotel gave us a voucher for one night in the A La Carte restaurant and found this to be excellent. There was plenty of casual seating area around the hotel. Didn't do much of the evening entertainment but what I did do seemed to be of good quality. This hotel was geared to couples and families and provided excellent value for money. We stayed in the Sa Coma Playa last July and had a great holiday. The rooms were very basic but adequate for 2 weeks. The rooms were cleaned regularly and the staff were very pleasant. Problems were dealt with promptly i.e. we had a problem with the shower and on our return to the hotel a couple of hours later, it had been fixed. The reps were lovely. Very approachable and friendly. The entertainment was good. Cha Cha Slide is a permanent reminder of Majorca for us now! My daughter calls it the Majorca Song!! Bart (Entertainer) was a big hit with the children - and he is quite good looking too! The location of this hotel was great, with the beach at the rear. Everything was close by. We really enjoyed this holiday - it was the first time that my children (age 5 & 3) have been abroad, they didn't want to come home. The location (right on the beach) is excellent. The hotel staff were very helpful, although the reps were on occassion a little cold. The pool was cleaned every day and the communal areas of the main hotel were swept constantly. The rooms were cleaned and bed linen changed 3 times in the week that we stayed.